This card is for my Mum for Mother's day. She lives in England, and so it is for the US Mother's day date. I made the card in a peaches and cream color scheme. The flowers are made from die cuts of Tim Holtz Tattered Flowers. The leaves are made from a Spellbinder's die, as is the butterfly. 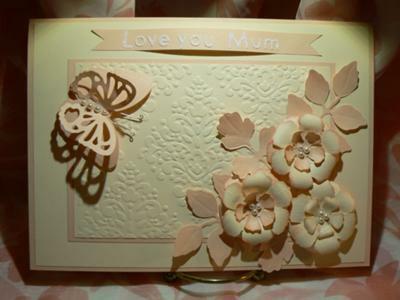 I added an embossed background, and sprayed the flowers and butterfly with home made pearl mist. The banner I mounted onto dimensional tape, but bowed it slightly to give an even more 3d effect. I inked the leaves and flowers with Distress ink in Tattered Rose. The flowers were mounted on dimensional tape to allow the petals to bow backwards a little. I textured each petal with the small ball side of a stylus I have had for years. I used it many times for transferring designs for painting. The butterfly I cut twice, once with the cut out design and one blank. I added a pair of jewelry wire antennae, and four half pearls in various sizes. Sorry about the quality of the photograph, but I hope to get better at taking the pictures, as I improve my card making skills. I have been making cards since December. I made a few choice Christmas cards, and have made a few birthday cards, one get well card and this Mother's day card so far. I need to get a little faster at the making part. Thanks to Christina and the many YouTube tutorials, I have many ideas. The card is just beautiful Julie and I can see your Mum with a tear in her eye when she gets her card. I love the colour scheme as it is so delicate and compliments the flowers and the butterfly to perfection. 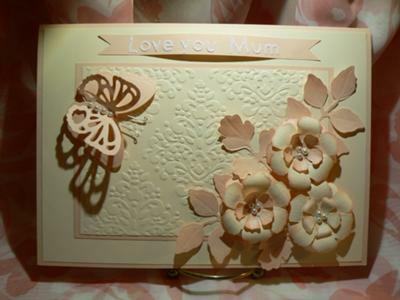 I am sure that you are going to get many compliments from everbody on this your first Mothers Day card. 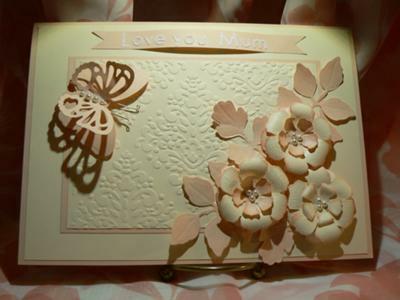 If you want to make a card as lovely as Julies then you will find all the Video Tutorials listed in the NavBar to your left and you are sure to find something there you will want to try. There is a whole series on Spellbinders ... from putting together some basic dies and then getting the most out of those dies, and I will be adding more soon. Comments for First Mother's Day card. This card really stands out, love the design. Thank you Christina, Terry, and Jenny for your very kind comments. It is very encouraging to receive positive remarks, especially from one's peers. I certainly am thankful to Christina for all her amazing efforts with her website, and now her blog.